When I was engaged, I probably put way too much time and thought into my wedding registry. I read wedding blogs, I picked the brains of married couples on what they used the most and what they wished they would and would not have registered for, I made my husband sit and talk about how he envisioned day to day life way more than was helpful while trying to plan a wedding and write earn an MFA/write a thesis. And while We are 4.5 years out and still loving most of our registry choices and still feel very loved when we look around our house and see gifts from people who wanted to wish us well as we started our life together, what turned out to be some of our most used gifts I never even thought to put on our registry. A sign with our last name and the year we got married that is now the centerpiece of our gallery wall, a mesmerizingly beautiful bowl that is probably meant for a centerpiece at a fancy table but given our current small table we have used it as a fruit bowl, and the useful little gadget of the Cuisinart Mini Prep. Nope, this is not a sponsored post for Cuisinart, it’s just that I’m not sure if I’d have gotten around to making this salad for lunch anytime soon without it. The mini prep is easy to store and fit on our counter and just seems much less daunting to get out, use, and clean than our blender or full size food processor. 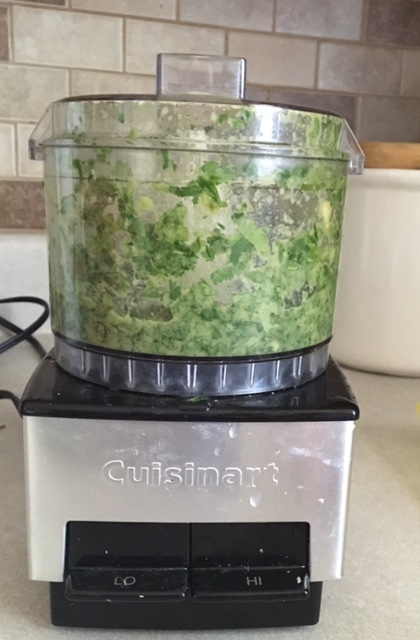 While we love those too (our blender is in an almost constant rotation with how much salsa we make and I don’t know how we’d do freezer meals in an easy fashion without our food processor! ), the mini prep is our go to for chopping just a little piece of something, or for blending up fresh garlic for stir fry or fried rice or small amounts of sauce. 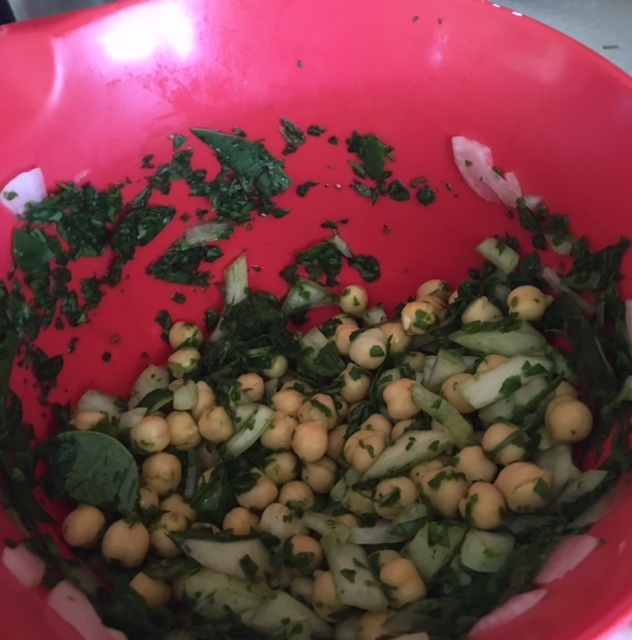 In this recipe for Cilantro Lime Chickpea salad , I used it to chop up the spinach a cup at a time and then to make the sauce that goes along with it. I’m so glad I had my mini prep to help out and keep this lunch quick and simple. 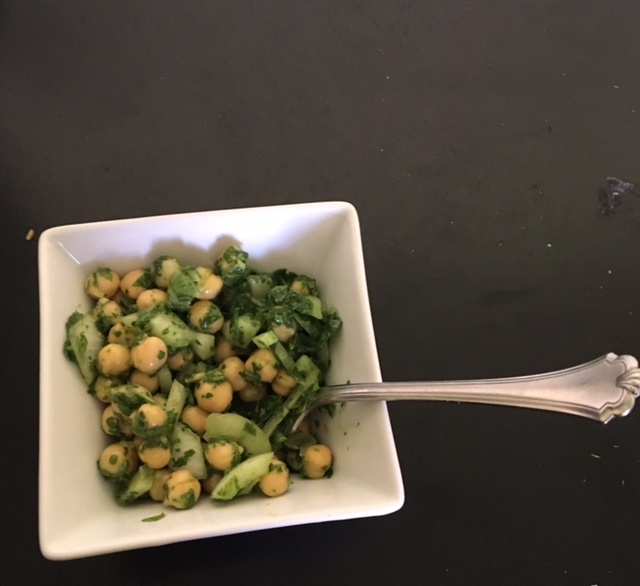 Especially since I found the dressing to be the best part of the salad and something I might make on its own (to be fair, the rest of the salad is just chickpeas, spinach, and onion so the dressing really is key). The dressing was tangy but I did not find it overwhelming. I also substituted in 1/4 of a lemon since I only had the juice of one lime instead of 1.5 and I really liked what that did to the flavor! This was yummy and filling and we chose not to even serve it over a bed of grains as suggested in the recipe- though I would definitely do that if I was planning this for dinner. The recipe definitely tastes better if you give it 10-20 minutes to let the dressing mix with the flavor throughout the salad. I got to taste it both ways since my toddler was not interested in waiting for his portion. 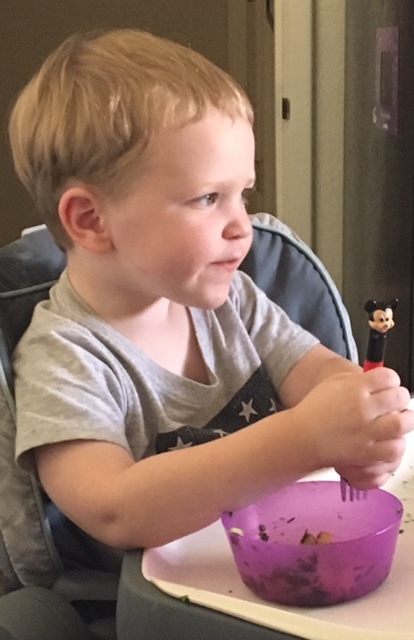 Still, even right away it is pretty good and it was toddler approved! When I make this again, I will probably mash the chickpeas a bit first before adding to the salad. Partially for me, because I don’t love the texture of that many whole chickpeas (I don’t dislike, I just prefer being able to mix everything a bit more) and partially for the sake of my sweet little boy who got a little frustrated trying to stab the chickpeas that kept rolling away from his fork!